CORPUS CHRISTI, TX – The City’s Vector Control unit is taking precautions to deal with the abundance of mosquitoes brought on by the recent heavy rains. 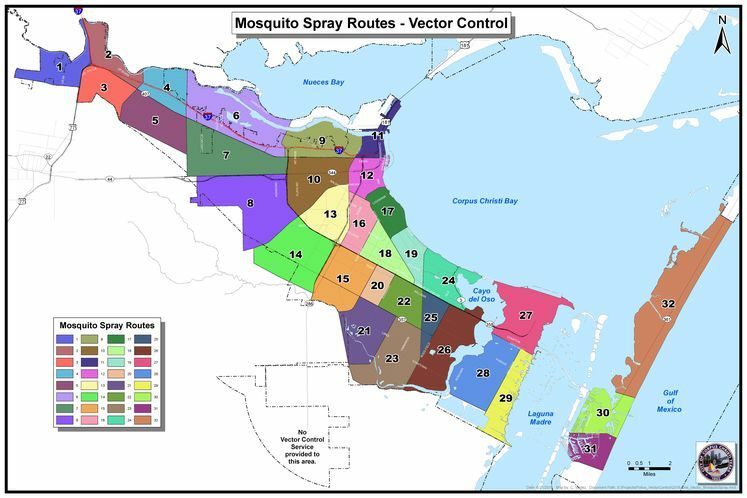 In an effort to bring us some relief, crews will begin spraying neighborhoods tonight at approximately 8:00 a.m.
Spraying routes are determined after checking mosquito traps and those areas with the highest concentration of mosquitoes will be targeted first. *These schedules are tentative and subject to change due to weather conditions and wind speeds. After any significant rainfall, it is important for the public to remember their role in the effective control of mosquitoes. There are a number of different mosquito species, some being active at night and others during the day. Aside from standing water, tall grass is a popular breeding area for many species of mosquitoes, so please keep your grass and vegetation trimmed closely.